Podunk: denotes an insignificant, out-of-the-way town, often used to dismiss significance or importance. Podunk is placid dullness and lacks contact with progress in the rest of the world. I’ve found we city folk have a lot we can learn from Podunk, Utah. 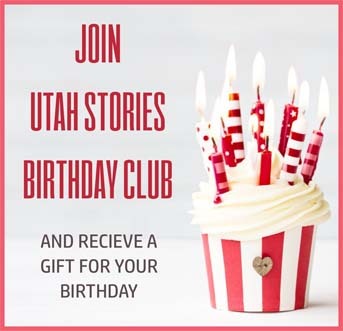 Sadly, Utah’s podunk towns are in decline, places where people really “think different.” (Which is Apple’s slogan used to sell Apple devices.) But if you own an iMac, iPhone, iTV, and look forward to the new iOS, chances are you aren’t thinking very differently from the 20 million others who also are buying these products. Podunk life requires people think differently and outside the box. Residents measure days not in status posts on Facebook, but in fence posts dug before the sun goes down. Seasons are measured by the growth of crops and the birth of animals. As urban populations increase, more of us are working in completely digital realms, where there is no physical evidence of any work completed. Some might look down on rednecks or podunks or hillbillys because they get their sense of identity from their fences, corrals and tractors, and skills such as pulling engines. Napoleon Dynamite (living in Preston, Idaho) had just one term “hacking skills,” to descirbe the skill required to use computers. Most podunks have bow hunting skills, but also demolition derby preparation skills (welding, scrap-picking, mechanical part alteration) — which are all highly valued. Physical skills include ditch digging and pulling calves out of birth canals without resorting to a scalpel. This is my fifth road trip in search of podunk Utah, and as usual, I was not disappointed. 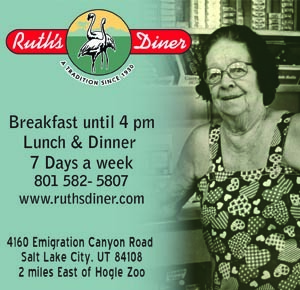 To reach Podunk, Utah I head north and exit I-15 to I-84 and head into the Bear River Valley. I wasn’t even aware that wheat is grown in Utah in mass quantities; here you find grain silos at nearly every large farm, and fields of silver-sheened waves. I read that famous Utah artist LaConte Stewart loved painting northern Utah more than any place on Earth. My first visit here in ten years and I can now see why. 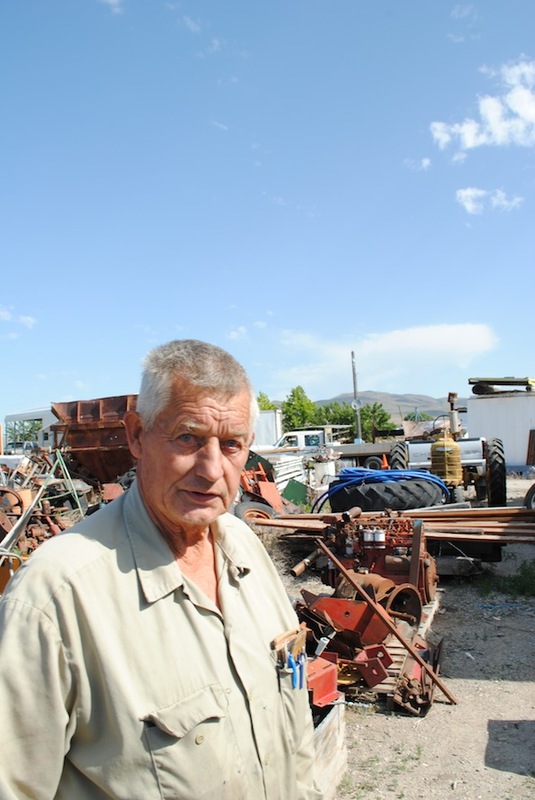 I pass over irrigation ditches and come to an impressive assortment of tractors, baccos and trucks and junk of the rusting-metal, earth-moving sort. 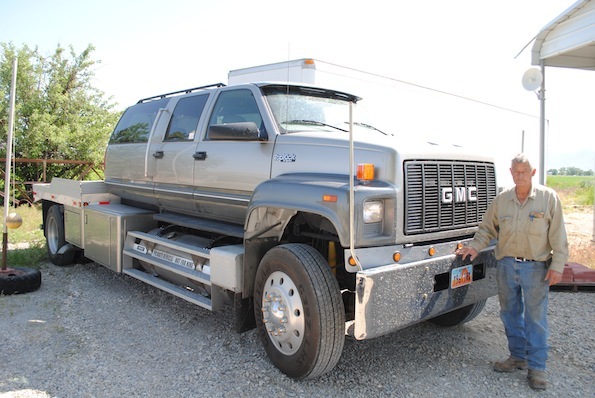 I meet Mel Kunfer as he is preparing his truck to do an excavation job. He gladly agrees to take me on a tour of what I will come to understand is the closest thing to an “evolution of the tractor museum” in these parts. 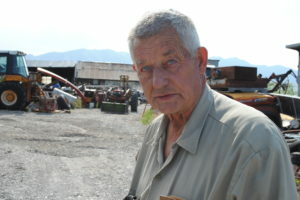 Mel tells me his six kids have “gone and went their ways as I told them to.” Much to the displeasure of his father, Mel started collecting junk when he was 25. His dad, always encouraged him to sell his steel for scrap. But, as Mel says with a sparkle in his eye, “One man’s junk is another man’s treasure.” Mel’s hobby borders on obsession but I wouldn’t go so far as to call him a hoarder. “You have the best working man’s inventory I’ve ever seen,” one friend told him. Many of Mel’s tractors are indeed museum-worthy. He first presents his Quickway and Bantam tractors— both built in the 1950s before hydraulics—which have mechanical shovels, that use steel cables and pulleys to dig. The Quickway is a great example of engineering that did not pass the test of time. A large boom extends from behind and over the cab. There is clearly a flaw in this design. The boom has smashed into the top of the cab. Mel explains that there were no brakes on the boom. “It was a process of running hand levers and foot levers.” There is clarity in the smashed and rusting metal, in which the design and its flaw coexist in this fine exhibit of Mel’s haphazard museum. Next Mel shows me his International Harvester. “They call it a Farmall.” The ingenious design has both an earth moving shovel and a forklift for picking up and hauling large farm stuff. I could go on to describe more of Mel’s tour and how much pleasure I find in rusting farm equipment and the evolution of the tractor, but I fear I may lose readers, so I’ll leave the rest for the inquisitive who wish to view my photos online. 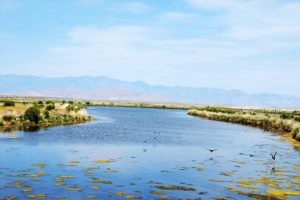 Is it hard to make a living in Bear River? What’s the nicest thing about living out here? Mel tells me he tried living in Sugar House for awhile, but the Bear River Valley called him back. 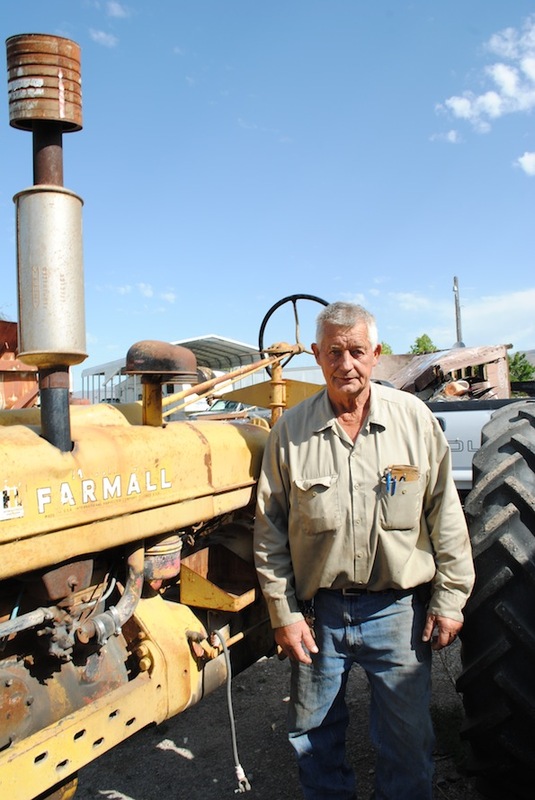 He’s too old to farm, but leases his land to a farmer who grows safflower for oil. Mel tells me there are quite a few good employers in the area including ATK and Autoliv. Mel has some of Autoliv’s old lockers, one of his sons works there. Mel’s home needed to be burnt down when it became infested with mold. He now lives in a double-wide trailer. 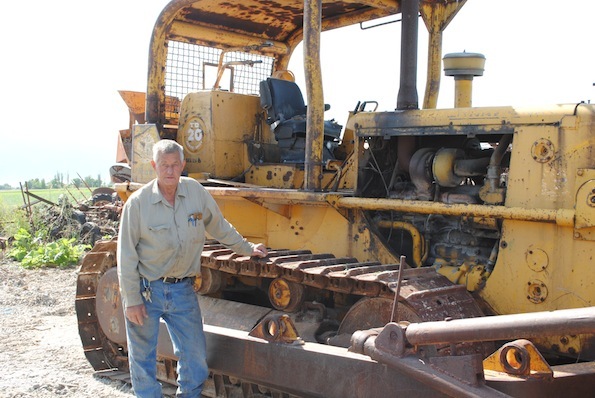 “I probably could sell some of this stuff to get the money to build a home, but I don’t really know who would buy it.” To restore Mel’s tractors would be costly, and while they are collectible, not many collectors want to invest in refurbishing 50-90 year-old tractors. Still, Mel’s garage and workshop are a thing of beauty and his “museum” will probably last only as long as Mel, the scrapers and treasure seekers will need to sort out which is which. For anyone who appreciates farm equipment, it’s well worth visiting.